If you’ve ever been treated with metal fillings, you know how they affect your smile. Metal fillings have a dark, unattractive color that stands out against a white smile. Beyond this, there are other including sensitivity to temperature changes, and lack of support for a tooth’s natural structure. 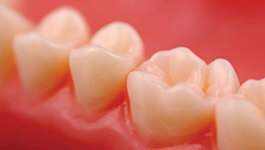 As a result, patients have partial functionality, and fillings may develop cracks at a later point. Thankfully, there’s a new standard that provides both cosmetic and restorative benefits over what tooth-colored fillings offer. The primary benefit of tooth-colored fillings is that they can be shaded to blend with your smile’s natural color. As a result, only you and our team ever know about your treatment. Tooth-colored fillings support the tooth’s remaining structure deterring breakage and insulating against changes in temperature. This makes tooth-colored fillings a more conservative solution overall because patients keep more of their natural tooth. The more tooth retained, the better teeth you’ll have in the future. Would you like to learn more about this cosmetic and restorative solution? Call our dental office in Wakefield today to reserve your appointment with Dr. Schumacher.